Kidde Fire Extinguisher Recall | Sidecar Racers Association West, Inc.
A pit lane fire extinguisher is not just a good idea: it’s a rules requirement. Aside from that, many of us have fire extinguishers in our transporters, homes, and out in the garage. We seldom need them but when we do, they have to work right-now, without fuss. 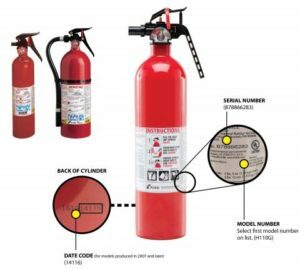 Kidde is recalling its plastic-top fire extinguishers all the way back to 1973 for both possible clogging and a possible failure of the valve to open at all. Please take a look at the following recall notice on Kidde plastic handle fire extinguishers and take appropriate action.